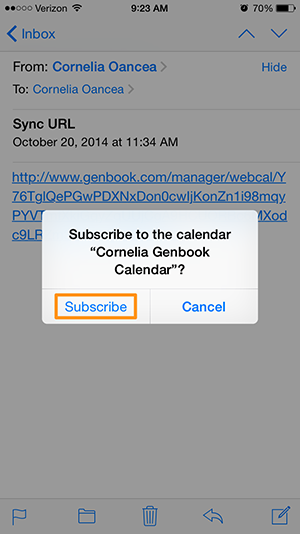 It's possible to subscribe to your Genbook calendar directly on your iPhone or iPad, even if you don't use iCloud. The instructions are the same for both devices, so we'll use the iPhone in all the examples below. If you're able to subscribe this way, move directly to step 6 from here. If not, follow the alternate process below. Tap and hold your finger on the URL to select it. Choose "Copy" from the options that appear at the bottom of the page. 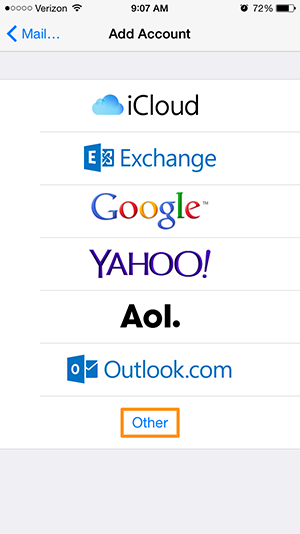 Navigate to Settings, then scroll down to and click "Mail, Contacts, Calendars". There, click "Add Account". On the following screen, choose the "Other" option at the bottom of the list. 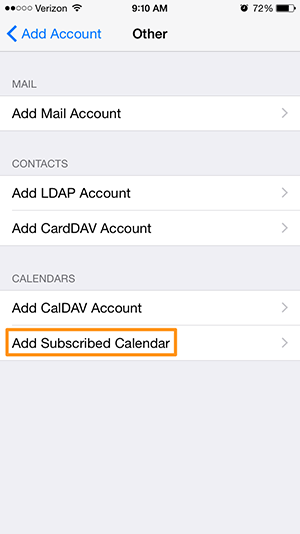 Then, click "Add Subscribed Calendar" under the Calendars heading (the option at the bottom of the next screen). 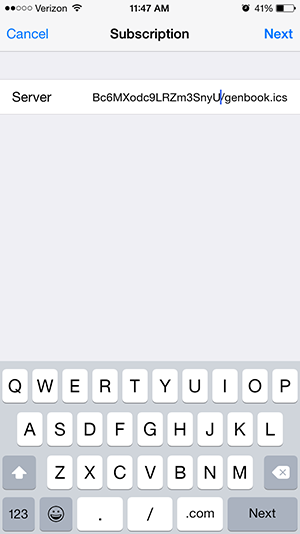 On the next screen, tap and hold your finger in the field next to the word "Server". When the option appears, click Paste, to paste the Subscription URL you just copied from that email you sent yourself. Then, click Next. 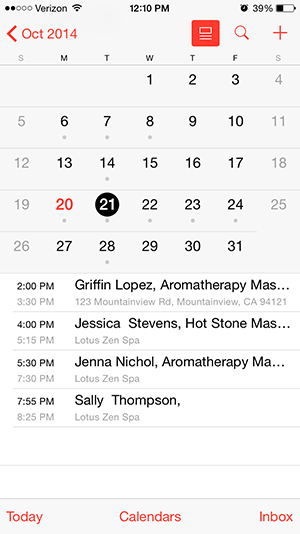 On the next screen, you can edit the subscribed Genbook calendar's Description (the name it will be given in your iPhone's Calendar) and save it on your phone. (We don't recommend setting a username, password, removing alarms or enabling SSL.) Tap "Save" to save the subscription. 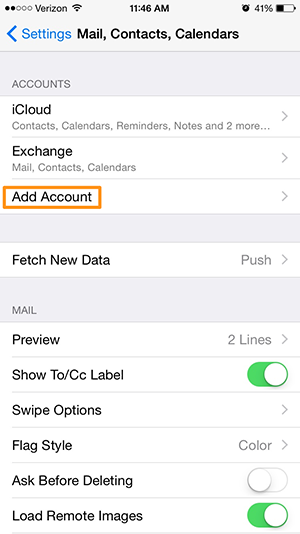 On the main "Mail, Contacts, Calendars" screen in Settings, click "Fetch New Data". 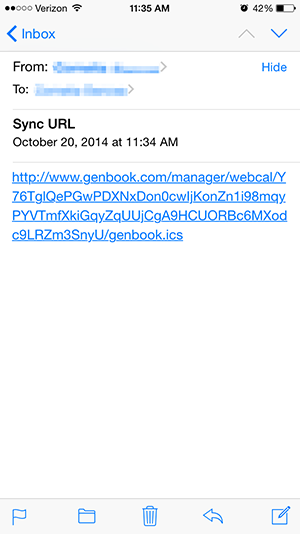 Locate the Genbook calendar and make sure the "schedule" of updates is set to "Fetch" (NOT "Manual"). 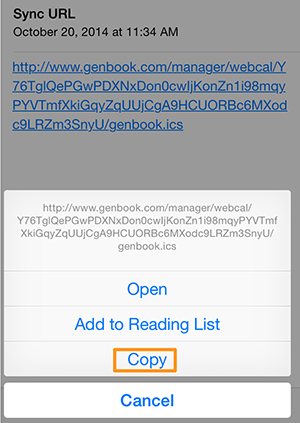 This ensures your Genbook Calendar subscription updates automatically at the interval of your choosing (instead of only updating when you have the Calendar app open). 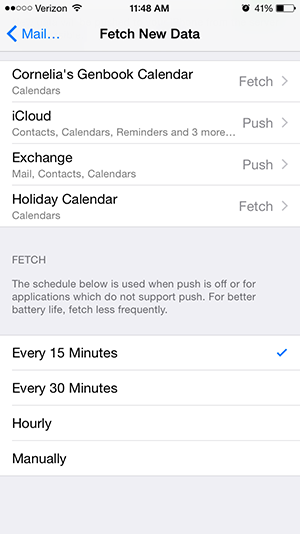 We recommend the shortest Fetch interval possible, so that your iPhone's calendar can be as up to date as possible with your Genbook appointments. 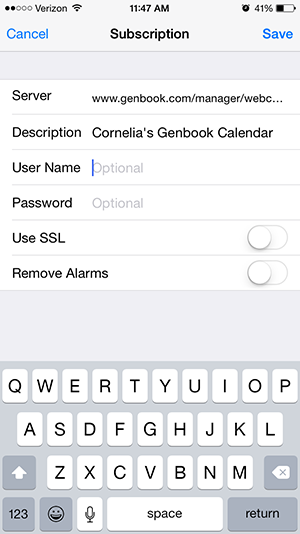 That's all it takes to ensure your Genbook calendar appears on your iPhone/iPad Calendar.